Your kitty’s clock is clearly not synchronized with yours. She may be waking early in response to internal cues, like hunger, or external cues, like sunlight. But it is also possible that your cat’s tactics are a learned behavior driven by desire for a tasty meal, companionship and attention. Whatever the cause, the behavior has become a habit and is unlikely to stop unless you implement some changes. Your first step should be to talk with your veterinarian. Your cat’s behavior may be caused by an underlying medical issue. Some conditions, like thyroid disease, can cause excessive vocalizations, restless behavior and changes in sleep and eating patterns. It’s important to rule those out before making any other alterations to her routine. Once your cat has a clean bill of health, though, there are several ways to address her early rising. It sounds as though your cat is willing to eat dry food but is waking you because she’s finished what you’ve left out and is ready for more. In that case, a good place to start would be by giving her a last meal of wet food before everyone goes to bed at night. You should also check to be sure she’s getting enough to eat during the day — if she’s eating the dry food you leave out at night and waking you early for another meal, she may simply need more to eat. Since it sounds like your cat is willing to eat dry food, another good option may be an automatic feeder. This would enable her to wake early and have her breakfast but not rouse you. Start by familiarizing your cat with the device by feeding her normal meals from the dish. Once she’s comfortable eating from the dish, set the automatic timer and give her a chance to get used to the tone or sounds. She will quickly come to associate the feeder’s noise with mealtime. Once she is used to the automatic feeder, set it to go off in the morning just before the time she normally starts crying at your door. If you would like to have her wake later, you can try to reset her internal clock by moving the feeder’s timer back a few minutes each day until you reach a more ideal feeding time. Another option is to leave one or two food puzzles filled with dry food or treats for her at night. Both strategies offer the possibility of meals being delivered independently, which should mean that everyone gets a little more sleep. One of the main reasons your cat wakes you is because, quite simply, it works! Your cat has learned that if she is persistent, you will eventually get up and feed her. Even if you only occasionally give in to her crying, your response still reinforces your cat’s behavior — in fact, an infrequent response can result in behavior that is more resistant to change than behavior that is regularly rewarded, because your kitty learns to be persistent. 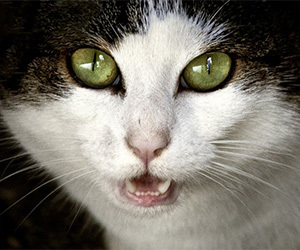 Ignoring unwanted behavior requires the will to withstand all unacceptable draws for attention, like yowling, meowing or pawing and only rewarding quiet, calm behavior. Be aware that deciding to ignore a behavior can cause an extinction burst, a period where the bad behavior gets even worse before it fades. It may take just a few days or several weeks for the early morning crying to end, depending upon how ingrained the habit is for your cat. Be patient and don’t give in. Of course, ignoring the behavior isn’t practical in every situation. If you have kids who are trying to sleep, for example, it may be difficult to ignore your cat’s early morning cries. If this is the case, try building on increasingly longer periods of quiet before getting up. Mark a moment of silence with a marker signal, like “good,” let the cat in your room and reward her. It’s OK if she meows after you mark and reward — it’s important that she begin to associate the reward with quiet behavior in order for the yowling to stop. Wait to deliver meals until your cat is sitting calmly and quietly. Over time, work up to longer periods of quiet before you reward, moving from what may initially be a couple of seconds up to a couple of minutes, for instance. Your cat may be waking you not because she’s hungry but because she’s bored. Encourage independent behavior and help her fill her time by providing a variety of mentally and physically fulfilling activities for her. Create outlets for species-specific behavior like climbing, scratching and hunting. Replicate the hunt by serving your cat’s meals in food puzzles or by dividing meals among multiple bowls in areas she frequents. You can also challenge your cat by hiding treats, food puzzles, catnip or toys in various locations, like on perches and cat trees, for her to find on her own. Your cat’s environment may also trigger her early waking. She may have learned to associate sunrise with mealtime. You can subtly change your cat’s sleep/wake cycle by using blackout blinds to keep her sleeping area dark. Your cat may also be responding to the sound of you stirring (even if it’s in your sleep). Consider adding a soothing nighttime background noise, like waves or a gentle fan, to drown out any noises that might wake her. Finally, consider giving kitty her own enclosed space, away from your bedroom door. Stock it with essentials like food, water, resting spaces, toys and a litterbox. Ideally, if she continues to be an early riser, she will learn to entertain herself in her room until it’s time for you to get up and join her.